SVBR Project is a pilot project for SC Rosatom in terms of implementation of large-scale high-tech projects in the nuclear industry jointly with a commercial partner. The project implementation form is also new and is connected not only with outsourcing of commercial investments but also with establishing a project management and business development joint venture. The project is a part of the Federal Target Program "Nuclear Power Technologies of the New Generation for 2010 - 2015 and until 2020". It is also one of the components of "New technological platform: closed fuel cycle and fast reactors" project, which is being realized under Commission for Modernization and Technological Development of Russia's Economy. The final product of the project is the basic technology of a lead-bismuth fast-neutron reactor adapted to a civil project, including construction of a 100MW(e) modular power generating plant and associated range of 100 MW(e) aliquot products. 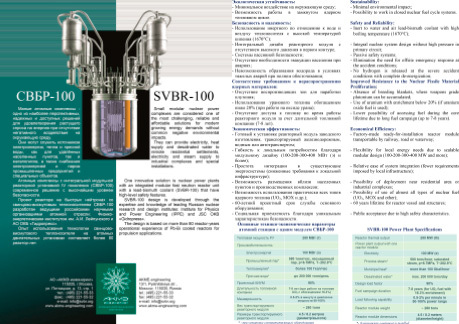 SVBR 100 Reactor Unit is one of the main components of the innovative nuclear power system based on unitized low-capacity reactor plants of the SVBR type equipped with fast reactors cooled with liquid metal lead-bismuth coolant. An important specific feature of the reactor is the integral (monoblock) layout of the primary circuit equipment where all primary circuit equipment (the reactor itself, steam generation modules, main circulating pumps etc.) is arranged in one vessel without any pipelines or fittings of the primary cooling circuit. 2024-2025 – serial production and supply of packaged equipment. The intrinsic sequrity and inherent safety properties (at physical level) of RU SVBR-100 allow making the structural design of power generating units much less elaborate and using the modular design principle. The RU SVBR-100 structural design includes the requirements of versatility in terms of the fuel used to enable fast conversion to MOX and later to nitride fuel as well, to serve the basis for fuel self-sufficiency in the closed nuclear fuel cycle. The RU design and parameters allow setting up factory manufacture of RU modules and their delivery to the site of installation by railroad or vehicle, which significantly reduces the labor costs and lead time of nuclear power plant construction. Serial manufacture will presumably allow achieving much lower production cost and stable quality of the product. According to IAEA estimates, the world demand for small and medium-sized reactors (100-400MW) by year 2040 will amount to 500-1000 plants. The aggregate capacity of this market segment is evaluated as 300-600billion dollars. There are very few projects of this type of reactor units of low and medium capacity existing in the world. The SVBR technology, according to its basic parameters, is a nuclear reactor of the IV-th generation, which may give Russia the status of the technology leader in the world atomic energy industry. SVBR may potentially become the first in the world commercial reactor of medium capacity of the forth generation based on heavy-metal coolant and occupy 10-15% of the emerging market of low and medium capacity atomic energy industry. renovation of nuclear power plant units (for example, VVER-440).